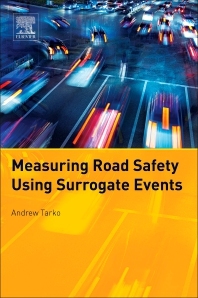 Measuring Road Safety Using Surrogate Events provides researchers and practitioners with the tools they need to quickly and effectively measure traffic safety. As traditional crash-based safety analyses are being undermined by today’s growing use of intelligent vehicular and road safety technologies, crash surrogates--or near misses--can be more effectively used to measure the future risk of crashes. This book advances the idea of using these near-crash techniques to deliver quicker and more adequate measurements of safety. It explores the relationships between traffic conflicts and crashes using an extrapolation of observed events rather than post-crash data, which is significantly slower to obtain. Readers will find sound estimation methods based on rigorous scientific principles, offering compelling new tools to better equip researchers to understand road safety and its factors. Andrew P. Tarko is Director of the Purdue Center for Road Safety at Purdue University. He is Chair of the Transportation Research Board Subcommittee on Surrogate Measures of Safety, an Advisory Board Member of Accident Analysis and Prevention, and has written numerous transportation research reports, conference papers, journal articles, and book chapters.